SCOTUS: Get Money out of Politics! Amherst Cinema launched the anniversary series with a screening of “The Queen,” the first film that the cinema screened back in 2006. Nov. 11, 2015 marked the launch of Amherst Cinema’s 10th anniversary year series, a year-long collection of screenings and accompanying events in celebration of the nonprofit cinema’s continued existence as Amherst’s film hub. Although the nonprofit entered the community in 2006, the creation is more accurately described as a rebirth. The cinema’s history began much earlier, possessing an array of identities before becoming the Amherst Cinema currently frequented by Five College students and the greater Amherst community members. Before it welcomed independent film lovers and foreign film connoisseurs, the Amherst Cinema building housed horses. In 1879, the building was erected as a livery which was used to stable horses, and subsequently, to sell motorcars. “After a major downtown fire [in 1926] the structure was sold, renovated and opened as a single-screen cinema,” Noelle Serafino, Amherst Cinema’s communications coordinator, said. In 1955, Samuel Goldstein purchased the cinema and gave it the name that remains today. After a period of significant deterioration and insufficient supervision, the privately-owned cinema was eventually forced to close in 1999, after screening its last film, “200 Cigarettes.” The roots of the cinema were preserved and in 2000, the nonprofit that continues to sustain the cinema today was formed. The cinema, rejuvenated by widespread donations, became a community effort, sustained by the population it served. It opened on Nov. 22, 2006 as a state-of-the-art three-screen cinema. The revitalized organization “quickly built a loyal and dedicated audience and membership base,” Serafino said. The cinema relies on both daily audiences and Amherst Cinema members for revenue, cherishing both ticket sales and the membership fee paid in exchange for various moviegoer benefits, like discounted tickets and free popcorn. Amherst Cinema has been successfully functioning as a nonprofit since, offering a rare venue for audiences to view the more than 240 films that are screened each year, including a diverse selection of documentaries, foreign films and classic masterpieces. The cinema also hosts an array of film-related, educational events, including visits by notable filmmakers and student film festivals. In 2013, Amherst Cinema also opened the Studio Theater, a smaller theater located a few steps from the main cinema building. The Studio Theater, containing a mere 25 seats, offers viewers a more intimate viewing experience. The Studio Theater “provides a space for screening film jewels that would not otherwise be shown within 100 miles,” Serafino said. Indeed, the room seems to communicate the essence of Amherst Cinema, offering audiences a viewing experience that cannot be achieved at the larger, blockbuster-wielding cinemas in the area. As Serafino explained, Amherst Cinema aims to nourish the sense of community in Amherst by fostering an appreciation for unique, culturally significant films. 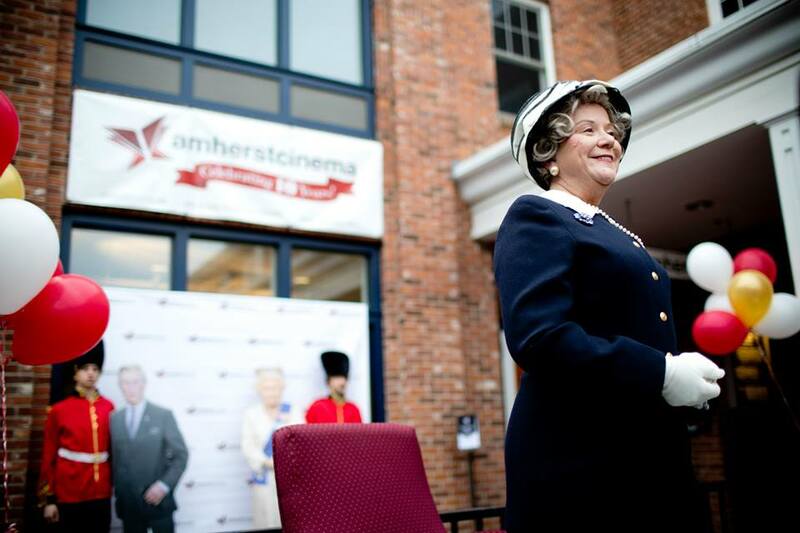 In celebration of both the longevity and continued progress of Amherst Cinema, the organization kicked off the 10th anniversary year with a launch party and free screenings of “The Queen,” the first film that the cinema screened back in 2006. Following the launch party, Amherst Cinema has screened, and will continue to screen, film favorites from years past, as determined by an audience poll. There will be a celebration year film every month. The next anniversary event will be an April 12 screening of “Jules & Jim,” a film about a pre-World War I love triangle consisting of Austrian author Jules (Oskar Werner,) Frenchman Jim (Henri Serre) and the impulsive Catherine (Jeanne Moreau). The film was directed by Francois Truffaut in 1962. Other upcoming films in the anniversary series include “The Seventh Seal” in May, “Once” in June and “Searching for Sugar Man” in July. Serafino believes there will also be a final special event at the close of the 10th anniversary year.